With our submission(s) for the VAST Challenge 2013, we received several awards and honorable mentions. The third mini challenge (MC3) focused on an international marketing company, called Big Marketing, employing a large staff of marketing executives who create and manage advertising and public relations campaigns for clients. Big Marketing has an internet research staff that stays current on the latest business, consumer and entertainment trends, searches for new markets, and comes up with ways to make Big Marketing’s clients stand out from the crowd. In addition, Big Marketing operates web sites for selected clients. The work within the challenge was to take the role as the Big Marketing computer network manager, ensuring that Big Marketing networks are up and running for both the Internet-facing web services and the internal workforce. This responsibility encompasses the full range of maintaining current operations, planning for future needs, and securing and defending network assets against threats. 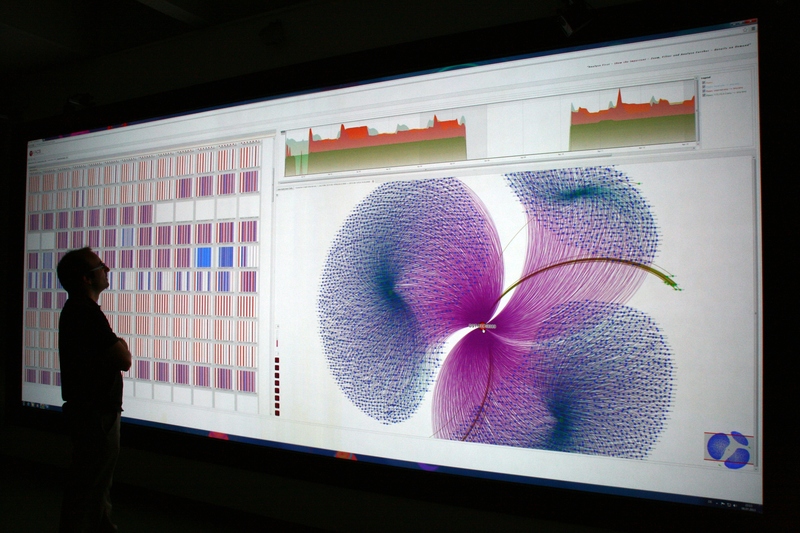 To address these needs, we built a visualization system to explore network traffic and used it on a large powerwall display as seen in the figure on the right, which is licensed under CC BY 4.0. The colored thumbnails on the left represent the different traffic patterns for many network hosts. Several time-series are shown as interactive line charts on the top. The quite cluttered interactive node-link diagram shows the connections between different source and destination ports and other external hosts for the selected time frame. This reveals suspicious network behavior and attacks to specific ports in the computer network. M. El Assady, D. Hafner, M. Hund, A. Jäger, W. Jentner, C. Rohrdantz, F. Fischer, S. Simon, T. Schreck and D. A. Keim.